Basically the idea is you start with four basic elements; Earth, Fire, Air and Water, and combine them to make other elements. For example; mixing Earth and Fire you get Lava. Mixing Air and Earth together you get Dust. And so forth. There are a ton of elements in the paid app, but I am not planning on doing all of them. Mostly the things I won't do, are several creatures, and the mystical creatures (i.e. vampires), maybe in an update I'll include them.. But for now, it will be the basics. The four borders on the very left is just for a box that displays the element. Starting with the brown glob and working down (8 total) and then moving to the right a column and back down. 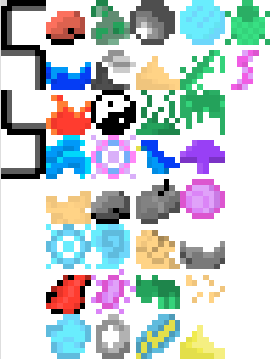 If you think you have a better sprite for an 8x8 element, let me know and I'll include you in the credits if I use yours. I'm definitely looking for a better metal sprite.. That gray shaded circle isn't the greatest. *Sorry if the use of "god" offends anyone, I'm using it in the lowercase sense for that reason. Wow a brilliant concept, loving all these games . More to come.. I'm just scared the color translation to my appvar using tokenIDE will botch up my colors I don't know how to prevent that. TokenIDE won't botch up your colors. Xlib spites use a limited color palette, and TokenIDE does it's best to match colors. If you use colors way outside that palette, though, you'll get some funky results, since it won't be able to match to a close color. It's on you to work within the palette restrictions. This is also available in TokenIDE, in both the sprite editor and the program proper (under tools). I love drawing sprites and textures and such, especially at limited resolution and low colours ... I must say those look fantastic. Obviously useless code, but I'm trying to find out a condensed way to check if A equals a certain number and B equals a certain number.. I feel there is a optimized way to write it.. Sorta like a switch statement. This time: Fixed the turtle, worm, Creature/beast (rabbit), beetle, bricks, butterfly, coffee, fern, (next column) grass, shell, snake, tree, coal, fish, human, limestone. The sprites are coming along nicely, I'll get them on calc soon and start programming, once I get help with the above question! Haha. Yes limestone. Not a potato. Maybe I'll add secret items, such as a potato. But for now. No potatoes. Palm tree, Reeds (cat tails), Scorpion, Blood, Cement, Ceramics (one of my favorites so far), Corpse, Dolphin, (new column) Domestic animals (cow), Hut, Oil, Steam engine, Tools (when its not touching steam engine it looks superb), Whale, Wizard, Concrete. I have 66 sprites so far! Still going. Haha. It's really fun squishing things into 8x8 pixels. I still have to fix my palette though. That won't be fun. Once I get a Virtual machine up and running I'll load up TokenIDE and get these sprites onto my calculator, that will be fun. And does anyone have an answer to my stupid code I posted? Hehe. That's actually not a bad idea. Again.. Maybe a hidden feature. Still working on sprites.. And trying to figure out a sane way then using the garbage code that I have. Any way I can use lists or something similar so I don't have to test both numbers with both variables? Of course, this is completely dependent on the fact that for the ones you listed, they are not equal. I will come up with another method that does this checking which is not dependent, if you need it. Alright, there is still progress on this! I just wrote some code that selects elements and combines them. So I deleted it and am going to rewrite it. There are 289 users online: 9 members and 280 guests. Members: commandblockguy, Jeffitus, matkeller19, realdonutking123, RogerWilco. © Copyright 2000-2019 Cemetech & Christopher Mitchell :: Page Execution Time: 0.640564 seconds.